Lacrosse is played between two teams. The object of the game is to advance the ball into the opposing team's territory and shoot the ball into the opponent's goal. The team scoring the most goals at the end of regulation play is the winner. The ball is kept in play by being thrown, carried or hit by the stick, rolled or kicked by one or more players in any direction, provided the ball stays in the field of play. A team is comprised of 10 players; 1 goalie, 3 defensemen, 3 mid-fielders and 3 attackmen. Each team must keep at least 4 players, including goalie, in its defensive half of the field and 3 players in its offensive zone. The 3 midfielders are free to roam the entire field. The game has four quarters, plus a halftime. Teams change ends between quarters. Youth games are generally 32 minutes long, with eight-minute quarters; two minute breaks between quarters and a ten-minute halftime. High school games are generally 40-48 minutes long with either 10 or l2 minute quarters and 12 minutes at halftime. Collegiate games are 60 minutes long with 15-minute quarters and a 15-minute halftime. Each team is permitted 3 time-outs, only two in a half of play. The game starts at the center of the field with a face-off. Face-offs are also used to start each quarter and to resume play after each goal. The ball is placed between sticks of two face-off players at the center of the field. The play starts when the official blows the whistle and face-off players try to control the ball. Wingmen are allowed to participate for control (release) of the ball. All other on-field players must wait until one player has gained possession or the ball has crossed a goal area line. Players maneuver the ball by passing, running, etc., to gain position which will provide the opportunity for a player to attempt to score a goal, by throwing the ball with their stick, past the goalie, into the goal. The only player allowed to touch the ball with his hands is the goalie. Players attempt to gain control of the ball by scooping or catching it with a stick or by dislodging the ball from opponent's stick by checking. Checking involves poking, slapping or hitting an opponent's stick and gloved hand. Players may also attempt to gain possession of the ball by controlled body checks. Attacking players may never enter the area immediately around their opponent's goal, known as the crease. Nor may a player physically touch the goalie while the goalie is in the crease. Should the goalie gain possession of the ball, opposing players may try and block the clear by standing in the goalie's line of sight and waving sticks. Opposing players may also reach into the crease to try and retrieve loose or ground balls, but may not interfere with the goalie. Unlike other sports, should the ball go out of bounds after an unsuccessful shot, possession is awarded to the player closest to the ball when and where it went out of bounds. There is a limit on the total number of players each team may carry on its roster. Most teams carry six to nine defensemen, six to nine attackmen, nine to twelve midfielders and three goalies. This provides three complete rotations of players (4 for midfielders). This is only a general rule of thumb and will vary considerably based on availability of players and coaching philosophy. There can be a maximum of four long sticks on the field at any one time (not including the goalie). The remainder must be short sticks. LexingtonYouth lacrosse does not allow long sticks until 7th grade. There will be situations (penalties) where one or both teams will be required to play with less than the full ten-member team. These are typically known as Man Up or Man Down situations and are usually handled with special field formations. Upon issuance of a penalty, which requires one or more players to go to "The Box", substitutes are not permitted to take their place. Teams must play with a reduced number of players until officials release penalized players back onto the field. The game is played on a rectangular field measuring 110 yards long by 60 yards wide. The field is marked at 55 yards with a centerline and at 30 yards across the centerline with an (X) to indicate face-off zone. (See diagram). Goals are typically manufactured of steel or aluminum, measuring 6 feet square at the widest opening and converging to a point 7 feet behind the opening. A mesh net is tightly secured to the goal. Each goal sits inside a circle with a radius of 9 feet, called the crease. Each crease is positioned 15 yards from the field's end line and 30 yards from each sideline. 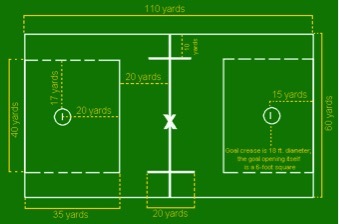 Goal Area - area inside restraining lines at each end of field. Defense Clearing Area - area behind two solid lines that run across the field 20 yards in front of the goal. Wing Areas - indicated by two lines, 20 yards long and 10 yards in front of each sideline. "The Box" Area - is located directly in front of the officials' table and is used as a holding area for players to wait out their penalties. It is also the access area for substitute players entering and exiting the field.